During the 1970’s Wheatland Electric Cooperative, Inc. became more aware of the need for better methods for protecting wildlife from electrocution on electric lines. A Wildlife Protection Program has logically become a significant part of Wheatland Electric’s goals for improving electrical system reliability. 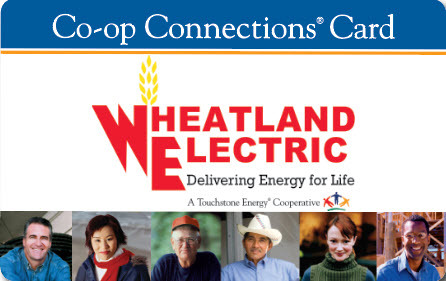 Wheatland Electric’s policy of attempting to prevent electrocutions for all wildlife species including birds of prey, Whooping Cranes, raccoons, squirrels, snakes, and many small bird species has two purposes; to protect valuable wildlife resources; to improve electric system reliability for our customers. In the early 1980’s insulated rubber-like bushing covers became available to cover transformer bushings. 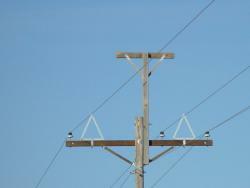 Wheatland Electric installed hundreds of these new bushing covers in areas frequented by squirrels and birds of prey. 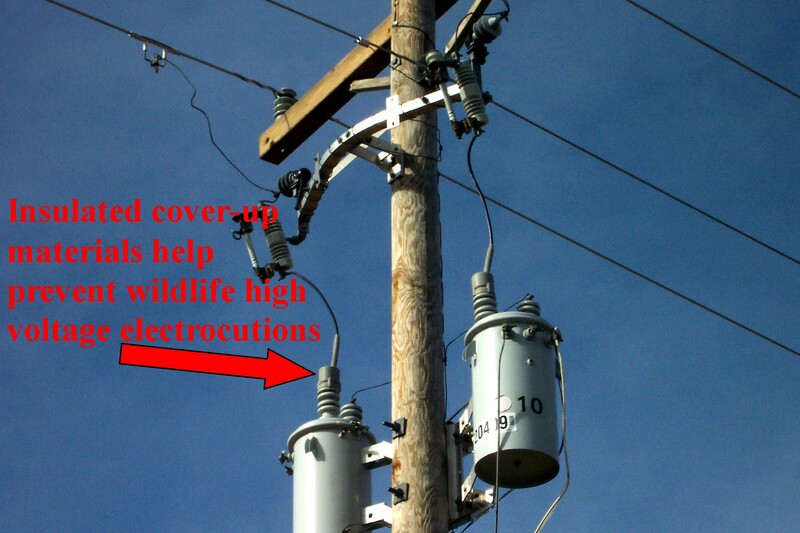 These covers appeared to slow the number of wildlife electrocutions while improving electric system reliability. In the late 1980’s, Wheatland Electric determined that nearly all substation outages were being caused by wildlife (snakes, raccoons, etc…) attempting to reach sparrow nests in electric substations presumably to eat the sparrow eggs and young. 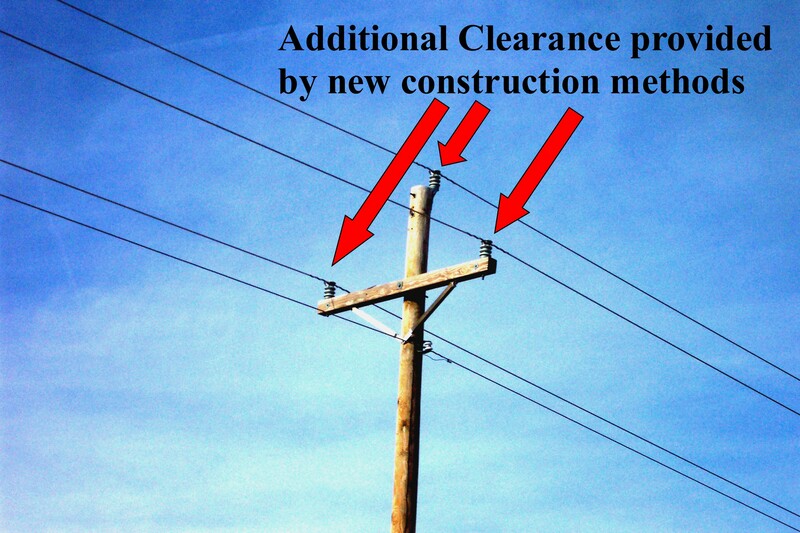 Today, Wheatland Electric field personnel have an aggressive sparrow nest removal program in place. 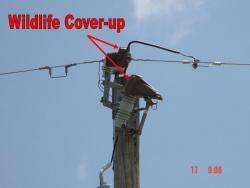 Outages in substations caused by wildlife, interrupting power to thousands of electric customers are now extremely rare. 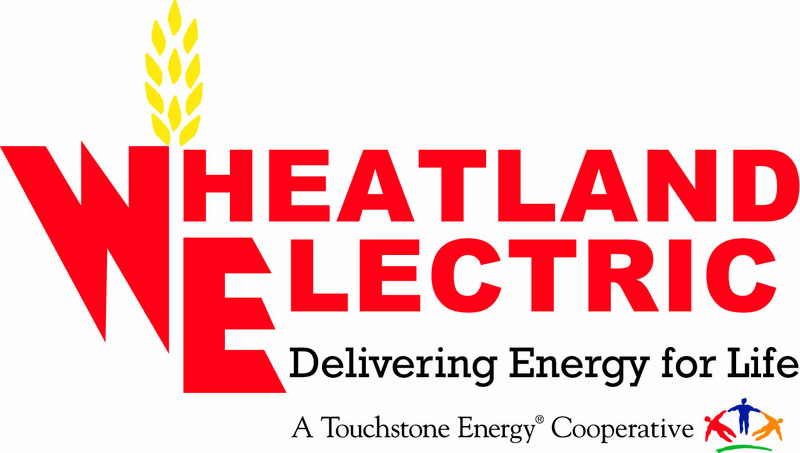 Throughout the 1990’s, Wheatland Electric continued to install thousands of insulated bushing covers, insulated jumper wire tubing, and began to experiment with better electric line construction methods. 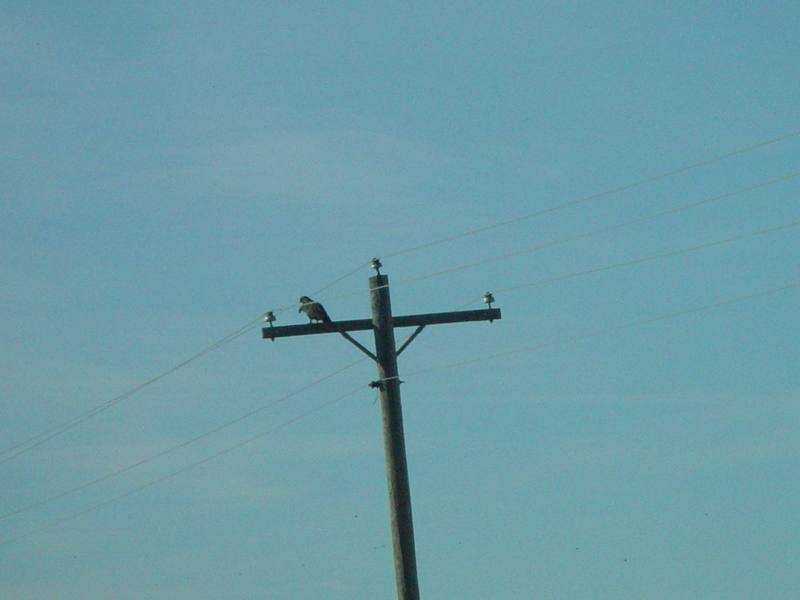 Raptor perches and deterrent triangles were installed periodically along a 25 mile electric line path from near Holcomb, Kansas to 12 miles south of Scott City, Kansas. Although the triangles seemed to deter raptors from setting on cross-arms where the triangles were installed, the perches did not assure that the raptor would utilize the higher perch rather than the cross-arm. 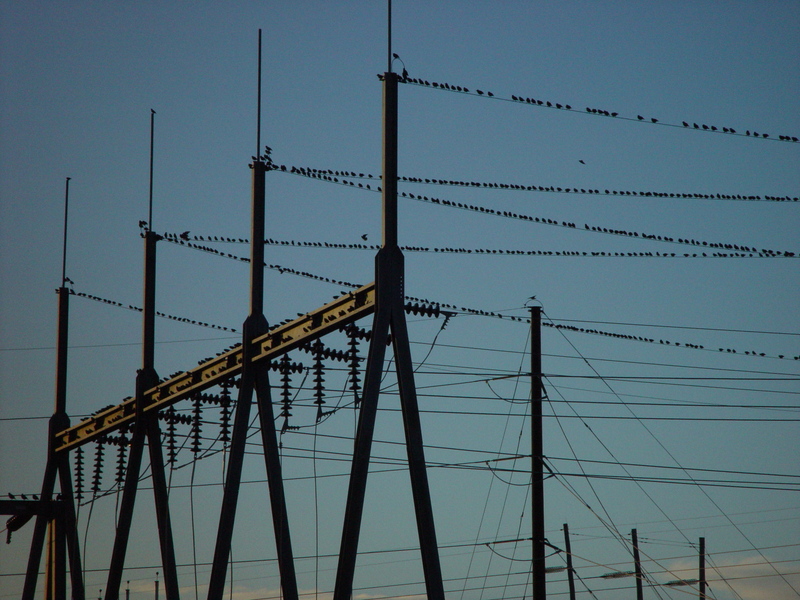 The logical conclusion was that raptor perches had limited use, but deterrent triangles could help prevent raptor electrocutions on cluttered structures that would be otherwise difficult to cover up. Birds do not always sit on the highest point on a structure; they often sit on a lower point and use the structure for shade on hot summer days. Wrapping sheet metal around specific poles approximately 15 feet off the ground has proven effective in reducing the number of raccoon electrocutions. The sheet metal prevents the raccoons from climbing high enough to come in contact with energized electric lines. Protecting squirrels from electrocution may seem of minor significance, however many of our customers feed these small animals and consider them personal friends in their backyard. As a matter of public relations, preventing the death of these friendly little backyard visitors is very significant. Underground electric lines are often damaged by gnawing rodents such as gophers. In areas known to be inhabited by gophers, all underground electric lines are installed in conduit to prevent such damage.